As a scholar of contemporary foreign policy in Saudi Arabia, I am starkly aware of the decoupage nature of researching in the field. Work detailing the external relations of the Gulf state is spread across an eclectic array of individual journal articles, book chapters and conference papers, with no singular treaties dealing with the subject in a holistic fashion. In today’s post-Arab Spring region, with fluctuating oil prices, an unprecedented war in Yemen and an intensifying regional competition between Riyadh and Tehran, the need for such a collective work is greater than ever. 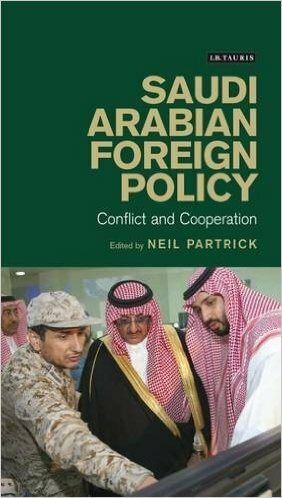 It was thus with some excitement that I purchased Neil Partrick’s edited volume, Saudi Arabian Foreign Policy: Conflict and Cooperation, a work that promised to unpack, detail and contextualise the complex nature of the Kingdom’s foreign relations. I was not disappointed. In this edited volume, Partrick has brought together an impressive array of scholars and regional specialists who provide their expertise across two thematic sections. The first, comprising three chapters, deals with domestic factors influencing the Kingdom’s foreign policy and the perceptions of policy makers today. Here, authors provide a historical overview of the numerous internal drivers that affect Riyadh’s approach to the outside world, including sectarian division, court intrigue and succession and the country’s mercantile class and business elite. Crucially, this section also provides a chapter unpacking the role of Islamic identity in the formation of Saudi foreign affairs, discussing the extent to which adherence to the mission of Islamic revivalism truly factors into policy making. This chapter also deals with influence of the country’s official (as well as unofficial) ulema in the formulation of this same policy. The section is capped off with a rigorous discussion on the critical issue of oil and how the sustainable extraction and distribution of the natural resource remains at the heart of the Saudi strategic world view. Having established the internal influencers of foreign policy, the second section provides 17 case study chapters examining Saudi Arabia’s relationships with its regional neighbours in the Middle East and North Africa, as well major international players such as the US, Russia and the EU alongside a few lesser states, such as Malaysia and Indonesia. These individual relationships are provided historical overview that helps to explain the existence of their dominant features, such as the oscillations of Saudi-Egyptian ties between regional cooperation and competition and the perennial tensions shared between the Kingdom and Qatar. While not necessarily providing ground-breaking new insights on these associations, these chapters nevertheless represent an accessible collation of the wider knowledge in a single, coherent and well-structured volume and are a gold mine for researchers wishing to establish or refresh a foundational knowledge of the Kingdom’s foreign relations. Few major issues are encountered throughout the book’s serious and rigorous approach to its subject matter. One slightly peculiar choice, however, is the decision to combine a discussion of all the South Asian states and East Asian states into two omnibus chapters. While this makes a degree of sense for India and Afghanistan, the omission of discreet chapters detailing the relationship between Riyadh, Islamabad and Beijing seems out of place. This is made especially clear when considering the two aforementioned chapters discussing the Kingdom’s far less notable ties with Malaysia and Indonesia. A singular focus on relations with Pakistan, for example, would have allowed for a more in-depth discussion on the issue of nuclear interdependence between the two states, which, as it stands, only gets two paragraphs. As a well written, insightful and deeply analytical endeavour, Partrick’s book can and should be considered the seminal text on Saudi foreign policy. The volume provides both an understanding of the inner structures guiding Riyadh’s decision making on the global stage, as well as a historical and contemporary account of its relationships with most relevant international actors illuminates while dispelling many unhelpful stereotypes. Given its accessible and exhaustive nature, it's appropriate for a wide ranging audience. I would recommend it as much to the lay person simply interested in understanding the basics of Saudi foreign affairs as I would to the veteran policy maker wishing to brush up their knowledge of the idiosyncrasies of Saudi-Jordanian relations.